Alumni, have you received your Alumni Governing Board Survey via email yet? Be sure to check your spam/junk box if it did not appear in your in box. Though there are not any questions that directly relate to your satisfaction with what has happened on the Hill, there are several comment boxes that you can use. If you did not receive a survey, but would like to complete one, may we recommend that you call the alumni department and ask that one be sent to your email address. With no true champion of the alumni who feel disenfranchised, serving on the AGB, now is the time to have your voice heard. Once upon a time, Shorter’s football season was confined to a card (not) listing a season’s opponents. Homecoming was marked by an asterisk placed halfway down the card. A good time was had by all and sports fans looked forward to basketball and baseball seasons later in the year. Shorter still has football cards—only now, there are real opponents listed, and Homecoming involves a real game at Barron Stadium. There is progress. Sports play a major role in college life for athletes, students, alumni, and the community at large. Shorter offers football, basketball, baseball, volleyball, golf, tennis, and lacrosse, to name a few sports—something for everyone. While you are cheering your team on to victory, we present for your consideration: Athletic versus Academic spending. Spending for athletic programs is on the rise, according to the Knight Commission on Intercollegiate Athletics. Overall, spending on athletic programs has increased by 38 percent, while spending on academics has increased only 20 percent. This general trend has manifested itself in disturbing specifics at schools like the University of North Carolina, damaging the reputation of the whole school, not just the athletics department. UNC’s football coach, athletic director, chief fundraiser, prominent faculty, and the chancellor are gone, the result of compromised academic integrity and financial mismanagement arising from the school’s athletic program. It goes without saying that now, valuable time and resources must be diverted to deal with the problem. Now, are we saying Shorter is in the same boat with Tar Heels? No. Are we saying Shorter University, with its quickly expanding athletic department, could look upon UNC as a cautionary tale. Yes. For most of Shorter’s history, athletics have played a part of life on The Hill. In the last several years, football has arrived on the hill. Shorter has moved from NAIA to NCAA, Division 2. Shorter now finds itself at crossroads: Does it remain focused on academics or pursue the road much traveled and find itself mired in the same muck UNC finds itself in now? Dr. Carolyn Ward, former Chairman of the Shorter Board of Trustees certainly worried about such things. Even after her time as chairman, she kept an eye on Shorter and on what was happening with regard to athletics. She expressed her concern about lowered admission and academic standards in an email to then-chairman, Nelson Price. In an email dated August 3, 2007, Price hastened to assure Dr. Ward that football “has done wonders for PR in the Rome area and been revenue positive”, but goes on to say “Inevitably it will at some point likely lower the GPA. Everything possible will be done to minimize this. Bringing in the athletes will do nothing negative to reduce the quality of education afforded the more studious students ” He goes on to add “Inevitably bringing in the athletes will result in more students with less academic capacity.” He was right. Does all of this bode well for Shorter? Not in our opinion. According to the Knight Commission, rapidly expanding programs with a multiplicity of offerings often point to an effort to raise overall academic standing within the athletic community. The expansion comes with considerable cost – in coaches, equipment, rental for playing fields and transportation to away games. When excellence in academics gives way to a public relations campaign focused solely on athletics, when payment to the Rome-Floyd Parks and Recreation Authority for the Spring 2012 use of Barron Stadium must wait to be paid from Fall enrollment funds and when, to put it in Price’s vernacular, “less serious” students are necessary on campus to improve the financial bottom line, everyone loses. In short, never lose sight of the school’s true mission – academic excellence. Ultimately, athletics adds to the college experience for everyone—the students, the student athletes, and the community in general. 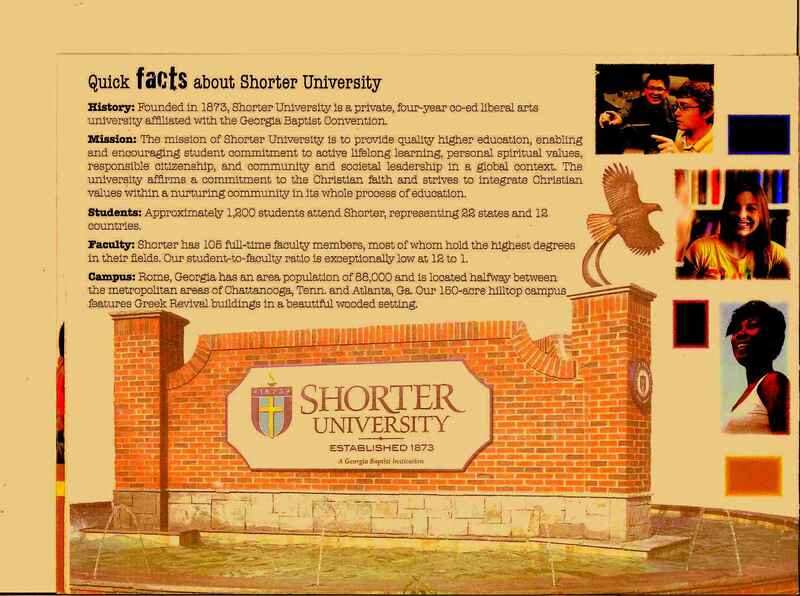 Shorter University can ensure the experience remains positive. Remember why you are there—remember who is in charge.